Strange Insurance Claims: Turtles & Squirrels & Blisters, Oh My! Australia-based travel insurer Cover-More has revealed some of the more bizarre claims it had to deal with over the past year. They included a traveller whose luggage was delayed by an airline but who only claimed for the cost of their razor, as they were heading to a nudist camp and hadn’t packed any clothes. Cheap date! 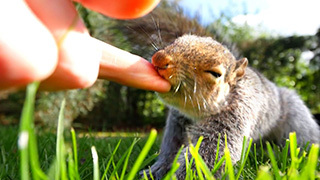 A vacationer in New York City was attacked by a squirrel they were trying to photograph and was left with a nasty bite that came with a $3000 medical bill. An overseas traveller didn’t check both ways before crossing the street and hit a cyclist with their suitcase, which knocked them both to the ground. The injured cyclist went to the police, and because the traveller had already dashed to the airport to catch their flight, they hired a lawyer to handle the police inquiries. The traveller ended up having to pay $3250 to the victim as well as the cost of the lawyer. In a really weird incident, a husband and wife in Samoa made a claim after a hairy incident involving a turtle at the Malua Turtle Feeding Pool in Upolu. The wife was feeding the turtle when it bit her hand and pulled her into the water, and her husband, in an attempt to rescue her, also took a tumble headfirst into the water. The couple claimed for their smartphones and a pair of sunglasses. A Cover-More traveller was struck with a dreaded blister after exploring a city by foot. No biggie, right? But when the blister became infected, the man was left with a limp and a medical bill in excess of $20,000. The funny stories can draw a laugh, but being stuck without insurance can be a very sobering experience. “No one wants to be the unlucky traveller stuck without their luggage, dealing with a stolen rental car, struck down by illness or unable to board their flight or make their connection, and in those moments, you can’t place a value on having travel insurance, especially when it can save travellers hundreds and sometimes thousands of dollars,” said Cover-More executive general manager of digital and direct Glenn Broadhurst.